When you hear about "rustic", I want you to let go of the idea that this décor type is without style or sophistication. In fact, rustic decor can be absolutely beautiful, trendy and eye-catching, especially if you like natural materials, simple lines and the patina of age. 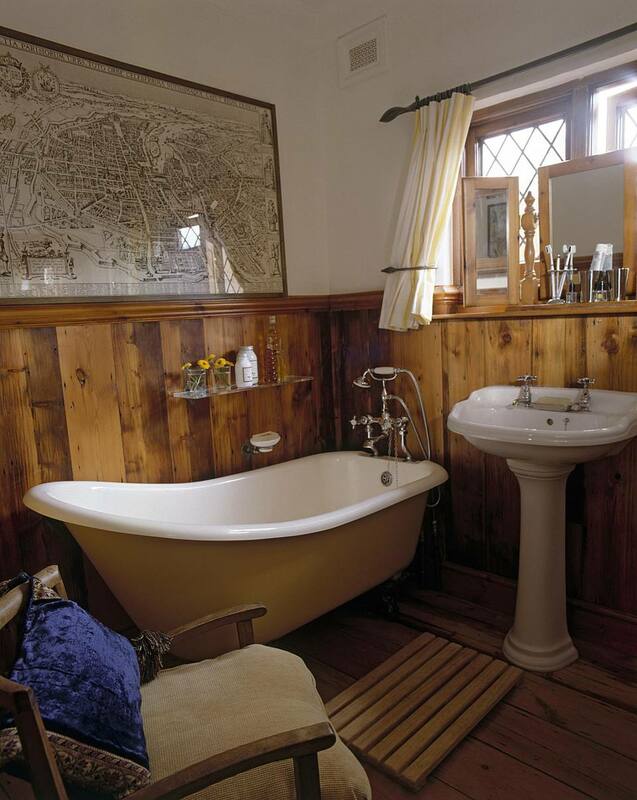 Rustic bathrooms feel comfortable, homey and relaxing. Their neutral colors, natural materials and focus on practical simplicity make them a nice choice for someone who wants to get away from the sterile look of modern or contemporary bathrooms. As mentioned above, rustic bathrooms are mostly in neutral, natural colors. Think natural wood and stone, beiges and tans, browns and greys. This natural palette can easily be perked up with leafy greens (the shades, not the food!) and even jewel and flower tones. If you find too much beige to be boring, you can certainly expand the palette a little, using shades that remind you of a natural space. Medium wood tones are a classic for rustic bathrooms, but using a balance of dark and light tones can also work well with good lighting. The materials for a rustic bathroom are pretty simple: wood, stone, pebbles, wicker--anything that you can find in nature and build out yourself. You don't have to, but it's good to keep this idea in mind as a way to decide which materials to use. Reclaimed and recycled wood are popular these days, as people are aware of the footprint of using brand new materials. It's also a good way to cut down on costs and achieve a truly rustic, "used" look for your bathroom. For the shower, tub and sink hardware, I suggest brass or brushed iron; something with a patina or a retro look will fare better than the shiny silver finish of your usual bathroom hardware. Find a shade that fits in the rest of the color scheme of your bathroom. A bathroom with Shaker cabinets will definitely achieve the rustic look, but you can also use vintage, reclaimed and recycled furniture and shelves. It's all about the whole not looking too "new", but rather beautifully aged by time and loving use. Try to get the retro-looking faucet design, to add to the rustic appeal. For the countertops, wood is certainly a good choice, but you can also go with a stone like granite or marble. Vessel or drop-in sinks work well in a rustic bathroom décor; vessel sinks are definitely more retro, but a little less practical, especially for shorter people. Wooden or brass free-standing bathtubs work beautifully in this kind of décor. When shopping for accessories, stay away from anything that looks too new or modern. Instead of pure white towels, go for a natural, unbleached cotton or shades that complement your neutral bathroom palette. Choose items that look (or are) hand-made. Stone and wood (or stone and wood-looking) materials work best, especially if it's the same as the other materials in your bathroom. If you need a shower curtain, go for one with few patterns (ideally none) and a natural shade like unbleached cotton. Use curtain hooks in the same shade as your hardware to tie the room together. Other decorative elements should remain simple and, well, rustic. A wicker basket, an arrangement of branches, hand-knitted throws and cushions, an old chair with a wicker seat; anything that reminds you of a farm or a cabin in the woods would fit in that kind of bathroom. As you can see, rustic doesn't mean ugly and unsophisticated. There is much beauty in traditions, natural building materials and years of loving use.